“Welcome to Transformation Airlines” Ruy joked. “You will be a new person after this experience”. He’s right and I am so happy that I did this and experienced the miracle of human flight! The sensation of flying and soaring through the air was both thrilling and peaceful; and these remarkable feelings far outweighed the moments of fear and panic and I had leading up to the run off the platform! I never thought I would go hang gliding – it wasn’t even on my first draft of my 30 before 30 list! I knew I wanted to experience something close to human flight, but figured parasailing over water would be a safe compromise. And I was no where near as high in the air when I claimed that Via Ferrata was the scariest thing I ever did, so the “old” me didn’t even have this in mind. 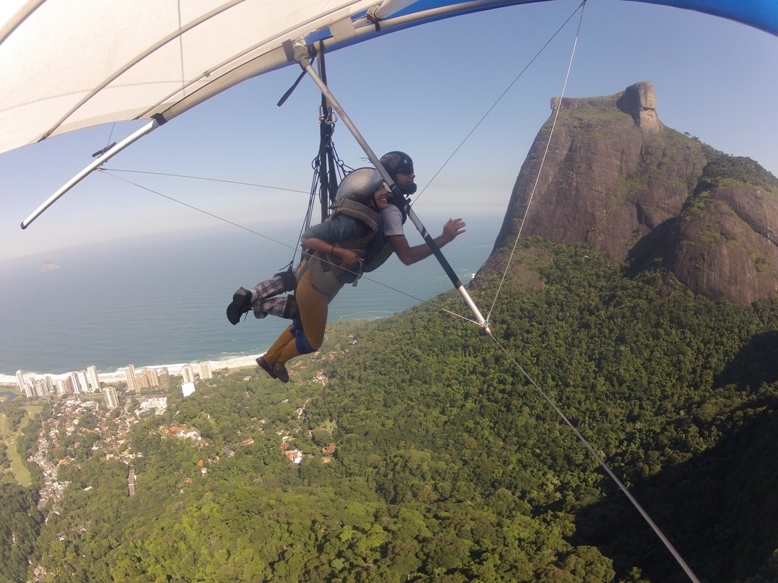 But after my sister invited me to South America and I started planning activities in Rio de Janerio, Brazil, I came to learn that hang gliding was an extremely popular activity! 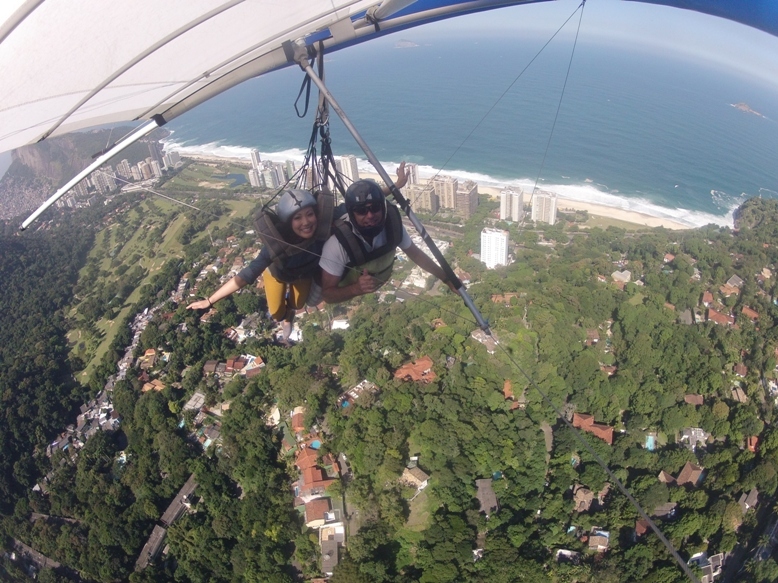 What a perfect setting to go hang gliding: you have the unique mountainous landscape with tall granite mountains next to white sandy beaches and turquoise waters, urban city and colourful houses climbing up the hillside, lush jungle surroundings and the world’s largest urban rainforest. 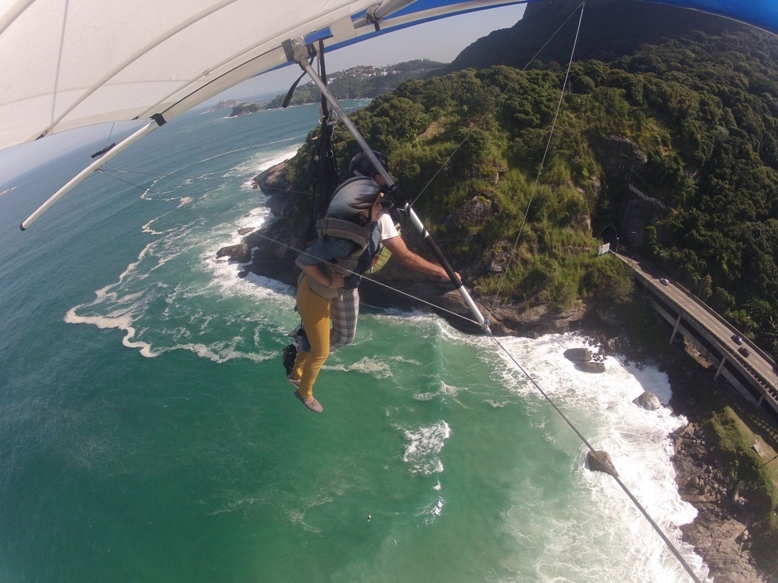 I started to think that I couldn’t go to Rio and not go hang gliding! But common-sense kicked in.. and fear. It wasn’t that long ago and not too far away from my home in Vancouver that a tragic and fatal accident occurred from hang gliding. I started telling a few people that I was considering going hang gliding. A part of me figured that since I put it out there, I would be less likely to back out! Many people referred to the accident and questioned if it was safe. Others were excited and told me I should definitely do this! After a run one day with Jules and Charlie, I showed them a YouTube clip and announced that I wanted to try this. “Go fot it” they said “We know that you like to do your research and we know that you’ll look into all the safety aspects. And you can even add this to your blog”! They were right. I DO conduct a lot of research (nerdy Science background ??) and I started browsing Trip Advisor and internet forums. I also casually mentioned that I was considering hang gliding while in Rio to John, who was running the B&B I would be staying at in Rio. I always go with Ruy of Superfly. He is a remarkable person, in the Guiness Book for most tandem flights, a TED speaker, and I think the safest and best flier there is. He actually uses his experience with people like you to lecture to groups on how to overcome fears. John told me to check out other fliers too, as there are many great ones in Rio. However.. that paragraph had me sold. Someone who is clearly very experienced and understands fear! I emailed Ruy and he responded immediately. He was very friendly and informative. He even shared a link to his TED talk at Sao Paulo about using the experience of hang gliding to over come fears and be more open to tackling other issues/goals in your life. The concept of brain plasticity was covered – how new experiences build new synapses and neural connections in your mind and strengthen your brain. You are teaching yourself to try new things and you can take this learning experience to all aspects of your life. I decided – this is the guy! I read on forums about people bargaining for a cheaper price and going for the cheapest flier out there but I decided I was not going to bargain on my life. I also thought that if conditions let up, maybe I would go on my last day and then have some time to mentally prepare. So I spoke to John and said that I would still like to go hang gliding and maybe he could could call Ruy and ask how conditions were (for later on in the week…). John gets on the phone and then turns to me and says, “Good news, conditions are perfect now. You can go in 1 hour”. Although we were in shock and still scared of being suspended hundreds of meters in the air, we went with it and decided maybe it’s better that we don’t have the luxury of time to over think this! A driver came to pick us up and drove us along the beach for my first glimpse of the famous Ipanema beach. We continued along the coast line as I marvelled at the beauty of this city! 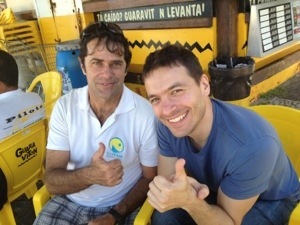 We arrived at São Conrado beach district and met Ruy Marra. Simply put, he is GREAT. He was charismatic, reassuring, intelligent and calm. He took us aside to a room to show us a brief video of the flight we would be experiencing to give us visual proof this would go smoothly. We then filled out some waivers and he continued to remind us that this doesn’t eliminate responsibility from him, so not to worry! After we paid our $20 R insurance and park fee, he brought us outside by the beach to a juice stand (one of hundreds in Rio!) and offered us a beverage he had concocted. This was unique because he added kale and quinoa. Delicious! – He showed us his license “001” First registered pilot in paragliding! -explained the Biological Hierarchy! We have 3 brains – we listen to them in order. Although we logically know something is safe, if we feel fear, no logic or rationale in the world will help! So he helped us with breathing exercises. – he was honest! Eric said he was thinking of going paragliding instead, but Ruy admitted that given the conditions, hang gliding was actually more optimal. After answering more of our questions, we took off in his car towards the scenic Tijuca rainforest and towards the Pedra Bonita granite mountain where we would take off. Immediately in his car I felt calm: there was the scent of lemon and eucalyptus wafting in the air. He told us this was on purpose, to calm our reptilian brain 🙂 Then he played soothing music on the radio. Already I felt so much more at ease! I thought we would just arrive and head straight to the mountain, but this process of us all understanding each other was amazing. Once we arrived at the launch pad area . I started to register fear. The launch pad was steeper than I thought! And it just goes out..into nothing! But we practiced the take-off together: running and breathing calming. The breathing tells your brain that you are OK.
What impressed me about Ruy was his patience and genuine interest in our well-being. He assured us we didn’t have to go if we didn’t want to. We could practice as many times as necessary. I didn’t see any other of the pilots practice with the hang glider. Extreme, maybe , but it showed the extra attention that Ruy provided us. He was funny! He told us to stand up tall and proud – to run as if we were late for a party, but then casually stroll in at the last second. He told us to imagine there was a chocolate cake on his back and to grab it, but not crush it. We noticed other people jumping off the edge of the platform and he advised that we keep running otherwise we will lose speed. And then it was up and ready to go! Well I ran off that platform and into the air – one of the best experiences of my life. I may have screamed but that passed in a second and I was enjoying the fligth immensely. I met a woman from Seattle who had also just completed her first hang gliding experience. She said she had done many other extreme activities: Sky diving, bungee jumping and hot-air balloon. This was by far her favourite because of the gliding you do. She also echoed my sentiments of adventure and peacefulness. She asked if I had done some of the other extreme sports and I told her, nope, just this. She seemed surprised….well, I’m not! Falling still scares me! With hang gliding… I was flying. Muito Obrigada to Ruy, Superfly and “Transformation Airlines”!! !